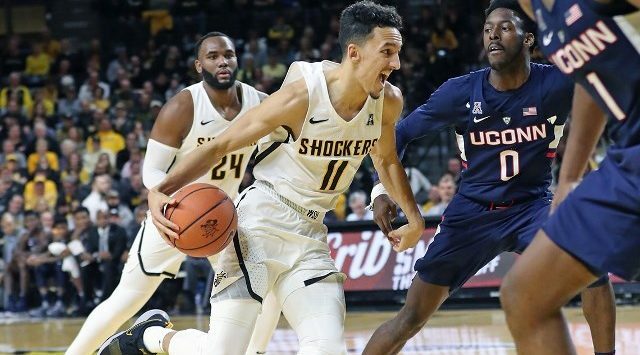 Landry Shamet’s professional journey will begin in Philadelphia. The former Wichita State standout was selected by the 76’ers with the 26th pick of Thursday night’s NBA Draft. Shamet – a 6-foot-5 point guard from Kansas City — is WSU’s 23rd NBA Draft pick but the first to be taken in the opening round since 1985 when Xavier McDaniel went No. 4 overall to the Seattle Supersonics. Shamet’s selection also ends a 33-year drought for Shocker guards, stretching back to the same 1985 draft when the Chicago Bulls used a second-round pick (No. 34 overall) on Aubrey Sherrod. He’ll become the sixth Shocker in as many seasons to make an NBA regular season debut, joining: Gal Mekel (2013), Toure’ Murry (2013), Cleanthony Early (2014), Ron Baker (2016) and Fred VanVleet (2016). Shamet declared for the draft on March 29 forgoing his final two seasons of eligibility. He’s WSU’s first early-entry draftee since 1982 when junior Cliff Levingston went No. 9 overall to the Atlanta Hawks. In just over two seasons as a Shocker (a foot injury cut his freshman year short after three games), Shamet piled up 914 points and twice earned first team all-conference honors. His 288 assists rank 20th on WSU’s all-time list and are the second-highest total ever for a Shocker at the end of his sophomore season (six more than VanVleet’s underclassman total). He ranks seventh all-time in three-point field goals (159), second in three-point percentage (.437) and second in assist-to-turnover ratio (2.64) behind VanVleet. As a redshirt sophomore in 2017-18, Shamet earned first team All-AAC honors and was an honorable mention Associated Press All-American for a Shocker team that finished 25-8, was ranked wire-to-wire in the AP Poll, and earned a No. 4 seed in the NCAA Tournament. Shamet averaged a team-high 14.9 points, hit a school-record 2.62 threes per game and ranked 13th nationally in three-point percentage (.442). He also led the American Athletic Conference in assists (5.2) and assist-to-turnover ratio (2.5). With Shamet guiding the offense, WSU finished third nationally in assists per game (18.5) and posted its highest scoring average (82.8 points) in 39 years. The Shockers went wire-to-wire in the national polls and earned a No. 4 seed in the 2018 NCAA Tournament. As a redshirt freshman in 2016-17, Shamet became just the second rookie to land first team All-Missouri Valley Conference honors in the era of freshman eligibility, joining former Creighton standout Doug McDermott. Shamet helped lead the Shockers to a 31-5 finish, a share of the MVC regular season title, an MVC Tournament Championship and a first-round win over Dayton in the NCAA Tournament.